I think I liked last year's better, maybe I'll like the road jerseys more. You'll notice the numbers on these are gold, last year they were green. Big question is will the names be left off the back again? Also the stripe design on the sides, my favorite part about last year's version, has been changed. These are the latest from Nike called Hyper Elite, and they will have some sort of cool design on the back. Here is an example of UVA's to get a better look. There will be another new set next year, no need to really care. As I said when this was posted last year, nothing will top 2006 road uni's. Wow, what a shocking change....this is going to take minutes for me to adjust to. Any way to buy these? Don't care. Just want to win games and watch them play good ball. How is practice going? Who is looking good? How are the freshman performing? Not that it matter's but what is the walk on situation looking like? How are Mike Mo's free throw experiments coming along? Are there any interesting match ups or story lines that have come up in practice? What is the projected/logical starting lineup for the scrimmage? Who cares about the jerseys, what about the important stuff? Haven't been to any practices this year yet. They start at 6am. Feel free to attend one and submit a write up to post on here if you want. 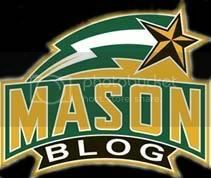 GMU has had 4 new uniforms in the last 6 years. Most of them have been good. The players really get into what they look like on the court. To many in the stands it's just "blah, who cares?" But to many it's a big deal. There are blogs about sports uniforms and articles on espn.com about sports uniforms changes. It is my understanding, that traditionally the Mason players have chosen what they wear, not Nike. Now, Nike has a massive catalog of every jersey style under the sun that they have. All their past designs have come from there, so I assume that where they choose from. As of a few years ago, the 2006 unis were still available. I'm not sure if they still are or not. No school wears that uniform anymore, so it's sort of old news. I think Oklahoma State was a few years ago. Although I personally liked the 2006 and wouldn't object to our wearing it again. why is there purple in the uniform? No idea what you guys are talking about, all I see is green, gold, and white. George mason is written in purple, and the outline color is purple as well. I think it looks real cool, just not our colors. You are either color blind or viewing the page on an old monitor. Or tripping her balls off. Anyone know where you can buy the shorts? I know VCU has their NEW jerseys for sale in their bookstore. We are getting LAST years jersey (no shorts) in ours. Thanks. anyone know if bookstore or other places have new shirts with the jersey script?